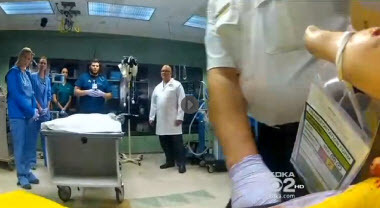 On Thursday, May 16th, 2013, KDKA aired a story on how using simulation at WISER prepares first responders and medical professionals for disaster situations. Susan Koeppen from KDKA reported on WISER's capabilities for training individuals for emergency preparedness situations. Mock victims, fake debris, smoke and audio recordings of explosions and sirens were used to simulate an explosion outside of PNC Park. During the simulation, first responders were on site to treat the victims of the disaster. The disaster scene was quickly transformed into a trauma bay, where the victims, which were manikin-based simulators, were transported for further care. Greg Porter from Ross, West View EMS, and UPMC Emergency Medicine Medical Resident Josh Shulman were two of the individuals participating in the simulation. Shulman spoke about being well trained and prepared in the emergency department, "...You never know what is going to come in the door, so you need to be prepared for anything. And that's what you get here at WISER." To see the full report, please visit KDKA Story on WISER.